Iirc, a dev posted on one of the threads complaining about particle spam specifically to comment on an effects slider. The comment was, essentially, that designing a slider in would have had to have been done back when the game was in initial design. That re-engineering the engine to allow for a slider would be a prohibitive amount of work and would likely have unintended consequences. What that suggests to me is that their subsequent attempts to address particle overload have been less effective because they are working within the constraints imposed by their initial design choices. To me, it seems like a curious design choice to one one hand say that, "We want players to focus on what's happening on screen (rather than on the UI)." while also making it as difficult as possible to see what's going on. I also want a way to drastically lower or even eliminate the massive particle blur anytime more than a very small number of players attack a mob. However, I have given up at this point. 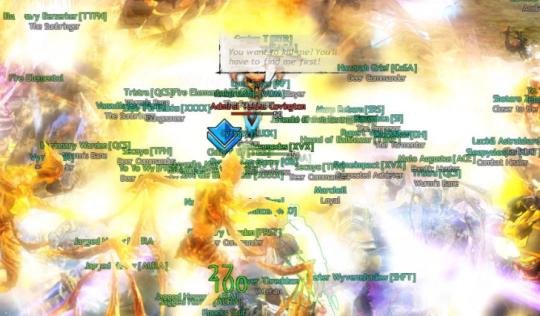 ANet has made adjustments to these effects, though the results have had minimal effect as far as I am concerned. If I remember that (old forum) post correctly, then a more drastic reduction option is extremely unlikely -- more's the pity. The things is, we don’t even need a slider. Game engine is not the cause of this issue, nor the reason it can’t be fixed. Anet can go back and redo the flashes so that they’re not bright instant camera flashes that are hazardous to health. Anet just simply refuse to do it. Look at all the cool visual effects in games out there. Not only do you not need bright instant flashes to make a game’s effects look good, but the good looking visual effects are artistic and creative effects, not mere bright instant flashes. I used to work at a certain infamous game company that just wanted to rush buggy games out the door. However, even this company took bright instant flashes seriously and changed visual effects if any were flagged by a single QA tester as possible health issues. The reason? If one tester is bothered by a flash, there will be thousands of customers who will also be affected by it. Anet really needs to have their QA team check out all the weapon skills and utility skills, and report the ones that are causing bright instant flashes. Then the devs should change these effects so that they’re not unhealthy bright instant flashes. This would be an excellent start. I’m sure a lot of players can make do with things like gathering tools causing flashes for now, since we do not need to look at the monitor while gathering. But a player’s own skills causing such bright instant flashes (made even worse in a group), when the player needs to look at the action going on, needs to be fixed ASAP. Again, we’re not saying remove beautiful visual effects. We’re saying change them in ways that are not hazardous to players’ health. It is just an option that many games have to increase performance. It is already to some extent in the game where you can disable all the fancy skins. The skins are not the problem. I don't have an issue with any skin, wardrobe part. The biggest problem are the skill animation and their scaling with enemy size. The generic ones that are available to anyone. When in a big train you literary do not see anything but strobs and flashes. My screen is fully covered with generic strobs, my performance drops to few frames per second and I can not see enemy designs, player designs and their flashy armor, their legendary animations. If anything this option would enable me to actually see those fancy legendaries, now I can't even see players. I am just tab targeting until I target the desired mob. And than if I am melee I try to look for the dmg numbers to see if I am in range because I definitely can't see my player model. I literary do not know how some bounties look like because they have smaller models and I have only done them in big trains. I was gonna bring my gf into the game, but now I think about it with her epilepsy and ANet not listening to us half the time, I think I need to keep her away. You have no proof of that. I believe hes referring to the "not responding to threads" but, there are some things in game that have been ignored(or appear to be, due to them being unfix able perhaps), but they dont communicate well. I agree, it would be so nice to be able to turn effects off, I hope that they make it possible in the near future. And even if they read and get the point people are bringing up, there's no guarentee their higher-ups will take it into consideration unless it becomes a big deal. ...The worst was for me the latest cinematic "ls4e4 Aurene visions"
Yeah, I bet I'd get a warning for posting flashy images here when recording that thing as a GIF and place it here. I am prone to seizures, I just started this game...but this thread does not bode well. I can't comment on anything that may or may not trigger for yourself, but this game is generally getting worse for it and the latest episode starts with an instance which is all flashing effects. The problem is Anet have been unable to address the issue at a technical level so far, which I can understand, but have continued to compound the issue with more and more items that stack the flashing and the particle effects. It would be mean for me to outright suggest they just simply don't care, but if they can't deal with the issue on a technical basis, they should never have kept (seemingly) wrecklessly adding more items and environs that do flash constantly or at least be more careful about it. Has anyone considered that Anet may be unable to fix this problem or indeed many of the major bugs that have existed in the game for long periods of time, simply because the programmers who originally created the content are no longer with Anet, and now, no one knows how to fix the problems? Video games are literally light shows of color and flashing on a screen. The vast majority of people complaining are people who either just don't like flashy effects or are simply looking for secondary gains and not true epileptics. Anyone with an actual medical diagnosis of epileptic seizures wouldn't be submitting themselves to bright flashy video games to begin with. It would be like a quadriplegic deciding to go for a swim. This is the most uninformed post I have seen in a while. I have been playing games for over 35 years. There are games that give me very painful headaches due to photosensitivity and there are that does nothing to me. I also have been going on stage for over 20 years. We have our own lighting technician due to my photosensitive migraines. Some strobs really hurt me even when directed at the audience. This game, in 90% of its content, is fine. Some effects, some cutscenes, some combinations though - knock me down real bad. And there are actual ways to reduce stress on the photosensitive folks. Some games employ them, and even then, since you cannot account for ALL levels of photosensitivity, they give you a warning. I usually don't risk it if it isn't a title I've been waiting for a long time. So, yeah, whatever you say. We're quadriplegics trying to swim. The flashing isn't an issue for just people with photosensitivity; it's a real health problem for everybody. Nobody has eyes that are immune to fatigue, wear and tear, and damages. Eventually, your eyes are going to get worse due to all the flashes in this game. I see a lot of people make these mistakes, time and time again. It never occurs to people how unhealthy something is until the damage is already done and THEN they regret it and start to make adjustments when it's already too late. I'm one of those people. 10 years ago, these flashing lights wouldn't have bothered me, but now, my eyes have gotten bad and all these bright camera flashes hurt my eyes. As much as I'm enjoying this game, I wouldn't have started if I knew about these flashing effects. Heck, I couldn't even get my friends into this game after they saw the flashing effects. There's literally no benefit to having these unhealthy flashing effects. There are plenty of ways to make visual effects that look great and a spam of camera flashes is not one of them. I have hated this since day 1. I do think they would fix it if they could, but I don't think it is an easy fix. I cannot get through this latest episode, get a headache after only a few minutes. Any suggestions (graphics settings, etc.) for turning down the flashing effects? In some spots I can't even see my allies it's so overwhelming. Thank you in advance. I haven't done this mission, but there are some settings that help a little. Postprocessing to "none" will reduce the brightness/intensity of lights. While it doesn't remove the flashes themselves, it still helps. The only drawback is that it affects not only the bright flashes and lights, it changes the entire game's atmosphere. Effect LOD checked on supposedly does something. I honestly can't tell the difference between this on and off. For me, the biggest help was turning my monitor's brightness way down for this game. It's very inconvenient since I have to adjust it constantly depending on time of day and game I'm playing, but the alternative is more eye pain (which is dangerous long term) or not playing a game I spent hundreds of dollars on. You may also want to look into the spec and weapon you're using. Some specs and weapons cause flashing lights (such as Holosmith skills). Okay, some people say they can't fix it. That is unfortunate if that's the case but it would be nice to at least get a statement by ANet about it. i have a curved screen and blue light protection in my glasses because of migraines, it seriously helps reduce the stress on my eyes. Personally, in addition of putting all my setting to low, I play classes with less flashing effects like necro greatsword /core engie rifle using photon forge only when necessary. Finally, I decrease my screen brightness to the minimum. HAHA! yeah the dogpile is a problem in all games you cant see kitten when everyone starts popping cds esp. In all games i have played you could always turn down or off particle effects, its odd you cant in GW. Epileptics are affected by it, people with migraines are affected by it, people with kitten computers are effected by it, and people who can't see the enemies because of it. (I wouldn't be surprised if the server itself would be affected by it.) Is that not a big enough reason for them to at least investigate it on a technical level? They wanted to reduce visual noise in HoT, and tgey started culling things as trivial as auras. Yet in PoF, they made every single sand effect have so much shiny sand that yiu can barely see anything. Why do we need so much sand? Why does it have to be as bright as the sun? I don't know. Have posted on this in the past and will keep doing so. The end goal, be that in GW2 or while GW3 is under works or concepts should be for player selectable options. That way for people that are impacted by light levels and those that are not can pick and choose as needed. This is not a new concept in MMO games. ANet has held multiple positions on this overtime and based on forum sample threads people are on various sides, hence the goal to be something a player can manage from their own client session would be a great mechanism. IMO there is excessive visual noise today and though its doesn't impact my health I can see how it would others and have had guildmates that it did. Recent patches have addressed some of this and I hope that future devevlopments in the game would consider this. Oh shinny is a thing, but when you multiple that by 'x' number it can get out of hand. Good gaming! Us epileptics tend to 'subject' ourselves to flash effects because we do not have a choice. You can say 'oh, there is a warning on the box'. Guess what? EVERY game and electronic thing does and they are not useful. At all. They are a CYA legal wording, that is all. What sets off one epileptic may not set off another, are we all supposed to avoid every game that exists (and tv shows, and computer monitors, and phones, and whatever) simply because of a vague warning all of them have because there is a 99.99999999999999999999% chance that it will give people headaches at most? In good design you simply do not do the 3d equivalent of a < blink > tag. Sadly they seem to be adding even more spinning and flashing at the same time in recent episodes, which is even worse for me than previous content's just flashing. Really don't understand the need for the new spinning effects as they don't seem to add anything to the game (you can still attack regularly while in them) other than making people's eyes hurt. The very idea that grown adults take responsibility for their own health sets off such vitriol these days. Why do you think we're posting here? It is because we are taking responsibility that we are trying to get Anet to fix these unhealthy effects. And no, saying don't play is not the right answer. A person with epilepsy playing games is not shunning responsibility. Having epilepsy doesn't mean that every game causes problems for you. In fact, a person with epilepsy can play games for years and not even know they have epilepsy until they encounter one effect that triggers their symptom. Heck, you or I could have epilepsy. And different effects have different results for different people. It's not a case of if one person suffered from epilepsy from a certain effect, another person with epilepsy will also suffer from that same effect. As many have said, people don't know what causes them issues until AFTER they encounter it. So, do you think Anet will refund our money? Are you going to refund our money? And saying others to not play at all is like saying, "Just stay in your house afraid to go out because you might get hit by a car." But if your idea of being responsible is to not play, you should stop playing this game, too. Do you think your eyes are immune to damages? You need to act responsibly. Go ask a doctor, learn that this game's effects are unhealthy for you, and you need to stop playing this game, right now! Go! Be responsible! In fact, don't even look at your monitor. That's unhealthy, too. Also, only eat healthy food. I'm sure you NEVER eat or do anything unhealthy, right? And you were born with knowledge of what is unhealthy, and you do such an excellent job taking responsibility. It's unfortunate that some people can't see their own reflections before pointing fingers at others. It's also unfortunate that some people will defend something that is unhealthy and has no benefit. I run the game on Max settings and im not getting these strobe lights? are you sure your computer isn't up to date? Also They already have a mode for you. "Performance Mode" strips the animations out of the game pretty much leaves you with what you need. Exactly. With me my big trigger is stress (lack of sleep, general life stress, whatever). Good luck avoiding every potential source of stress. Yes, I avoid overly flashy things but not everything that might set off a seizure with someone .... practically everything in the world has some potential of doing that, it is separating the things that have the possibility from the things that have a likelihood. For people who still do not understand look at it this way: do you drive? Why? There is a chance you could get in an accident. Do you go out of your house? Why? There is a chance you could be hit by an asteroid. Do you play the living world? I use 8 Winter's Heart,8 Ghostly.1 Ember,1 Celestial(blue), and Winter's presence/or Nightfury +The animations from which ever legendary i happen to be using at the time. Okay, did you do the first instance in the first episode maybe? Several layers of purple effects with random motion and flashing elements. Even if you somehow turned off all the flashing elements completely that would be enough to give at least a headache to some people if they stared at it too much. I just bought lws4 ep1 and the first mission in that gave me a headache. Had to play with postprocessing off and have the camera pointed at the ground the whole time. I was only worried about camera flashes that hurt my eyes, but I’m getting more and more concerned about the direction GW2’s visual effects are heading. EDIT: One thing that I just remembered that might be helpful. The reason I got a headache in above's story mission is due to motion sickness from the wavy purple effects. There's a way around that works, at least for me. When I play a first-person shooter for the first time in a while, I get a bad headache after like 5 minutes of play. So what I do is play very little until I get a hint of a headache then stop playing immediately. The next day I do the same. Doing this, it slowly increases the amount of time I can play before I get motion sickness and within days, I can play FPS without headaches. Of course, if you get seizures, you may want to be VERY careful with this mission. I have a beast of a machine. Stable 80-100 FPS although I limit it to 60 so as not to have big variations. Performance mode is not that. You are saying there are no strobes because you are not sensitive to them and just not seeing them. I bought LWS4 ep2 yesterday and played through the first 3 story missions. There were so many blinding flashes and bright lights even with my monitor set to dark. I really don’t know what Anet’s visual effects team is even thinking. This game’s flashing effects are embarassingly awful and by far the worst I’ve seen in any game. It’s such a shame, really. The rest of the game is so amazing, but the visual effects just kittens on the game. This. PLEASE give us more options to reduce this, the effects are way, way to intense. do u continue the eye hurting bright flashes bcs u know it makes the player feels not sleepy and so plays longer ? edit to make it more understandable Casinos doin the same things they have bright flashing lights, there are more similarities to game design and Casino enviroment but i stick with the lights now. why they are all different topics or u prefer i put gathering tools with this topic together bcs reasons? Well it has more chance to HURT peoples eyes. Which makes them take a break. There are several ways to reduce eyes strain. Monitors that have settings to produce less blue light. Glasses that will filter out blue light. Don't play in dark rooms. Take breaks. The eyes say one thing about the world and its orientation and your movement through it. Other senses(1) say something else about the world and its orientation and your movement through it. Your brain can't process this conflict. That's why closing your eyes can help, because you remove one side of the conflict. Now let's translate that to video games, both in general and specifically GW2 and its mounts. The movement you see on the screen says this about what's going on, via your eyes, and yet those other senses say that you're sitting relatively motionless in your chair. Conflict. Sick. It doesn't affect everyone like that, and one thing that should help here (since "close your eyes" isn't a good idea in a video game) is to reduce the angular size of the view into the game world - use a smaller screen at the same distance, or the same screen further away, or play windowed mode with a smaller window. Options for reducing the "induced motion" on mounts (i.e. reducing the "sway" and "bump" that you'd get from actually riding a biped dinosaur / hopping bunny / etc.) should help reduce that conflict, except that the game doesn't have them. Balance, driven by the semi-circular canals in the inner ear. Total-body linear and angular acceleration, also driven by those semi-circular canals. A pile of kinesthetic and proprioceptive senses that tell us where our body is relative to our heads(2). (2) Processing the sensory data from the body to produce this information is fairly intensive, and puts "we only use ten percent of our brains" firmly in the category of nonsense, since it requires something like a quarter of our brain mass to do it. Eye pain is just a side effect of what the bright lights and flashes are for and thats it for keep u playing longer. Like in a Casino u get constant stimulated by blinking and bright lights. The conspiracy theory i have here is anet doin this on porpuse to make u extend ur play time.